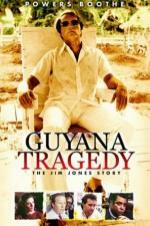 Buy or Rent Guyana Tragedy The Story of Jim Jones (1980) Movie DVD & BluRay Online! Movie Plot: Based upon the true story of Jim Jones, a self proclaimed prophet. Jim Jones had a loyal following of about 1000 people, who had donated their entire life savings to him to join his commune. When possible illegal activities came to the attention of the authorities, they started to investigate. Rather that faces the charges, Jim Jones committed suicide, and convinced virtually All of his followers to do the same.